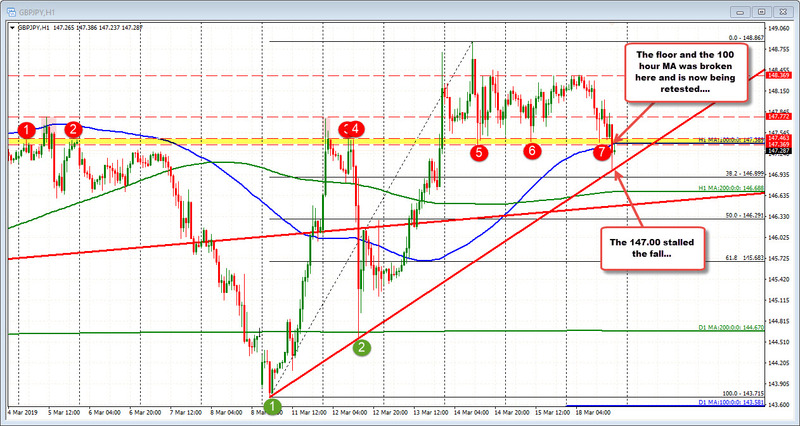 The GBPJPY cracks below floor support and 100 hour MA. The GBPJPY has made a crack lower (with the help of the GBPUSD and USDJPY moving lower as well). The fall has taken the price below swing lows from the last 2 days and the earlier low today. Those levels come in at 147.369-463. Also broken that area was the 100 hour MA (blue line) at 147.389. We are now back up retesting the break area. If the selllers to remain in control, that area should attract sellers. If the price starts to trade back above, the selllers on the break, will likely be forced to cover...Stay below and the trend line remains the target to get below for downsiide momentum potential.